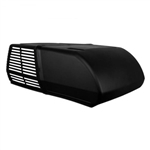 The Coleman Mach 9330-5221 Air-Vantage Conversion Kit allows you to convert your Dometic Ducted and ducted with heat pump to a Coleman Mach air conditioning unit. Kit allows you to use your existing Dometic CT wall thermostat, control box, and ducted ceiling plenum making the installation easy. Reuses ducted plenum components including the Dometic CT wall thermostat, grille, filter, screws and screw covers, and Dometic control box. Does not reuse the 4 bolts and mounting plate to mount the Dometic rooftop unit. Includes (1) plenum plate, (1) mount frame, (1) divider flange, (6) mounting screws, (4) mounting bolts, (1) wire harness adapter, (1) resistor plug adapter, and installation instructions. Note: If your current system is not controlled by a CT wall thermostat, Air-Vantage will not provide the necessary components for replacement. Also will not work with Dometic AC units that have 3-speed fan.